When your youngest gamers are still struggling with the basics of taking turns and matching pictures, it’s hard to find games that work for the whole family. Cooperative games can help, but there are few that balance ease of play with satisfying strategy. 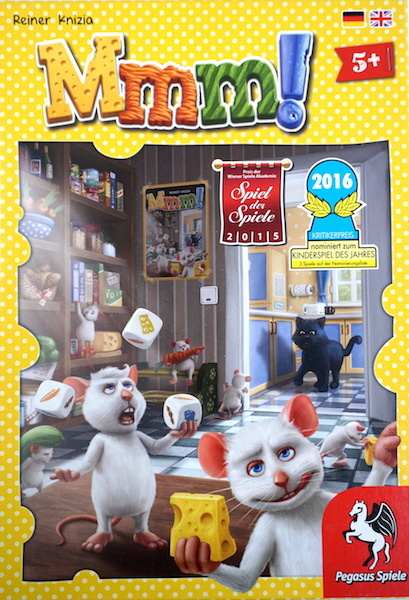 In Mmm!, you and your fellow players play the roles of mice stealing food from the pantry. But there’s a cat sneaking closer and closer with every move you make! 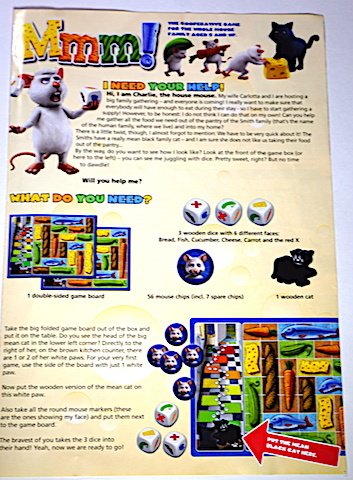 Read through the instruction story book, where your host Charlie the mouse will introduce you to the concept of the game. 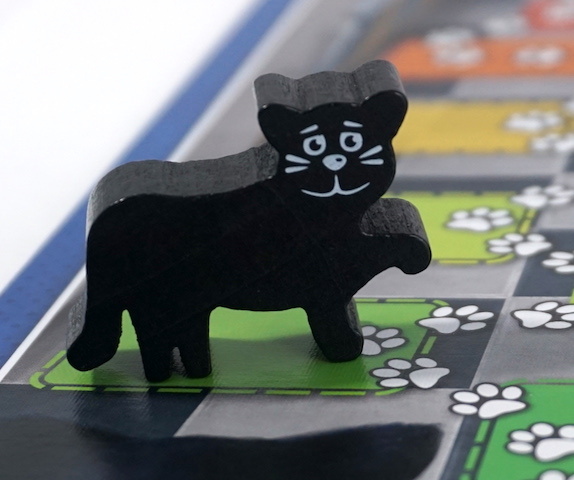 Unfold the double-sided gameboard and decide whether to start at 1-paw or 2-paw difficulty, then place the “mean cat” in her starting space. On your turn, roll the three dice. 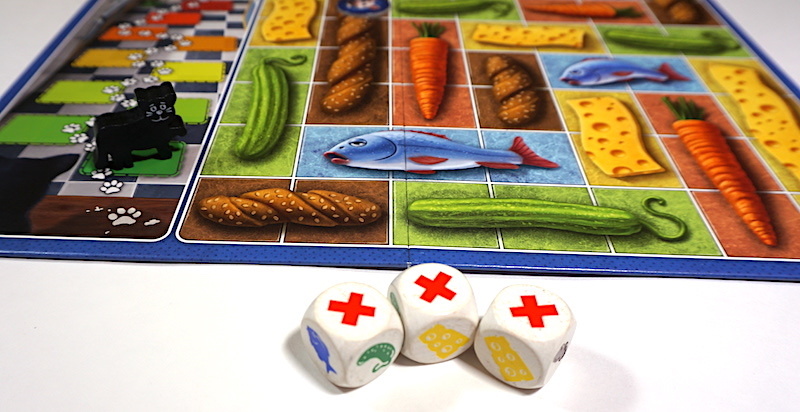 Place at least one die on a food space matching its symbol (bread, fish, cucumber, cheese, or carrot), and then roll any remaining dice. Place at least one die again. You may re-roll again as long as you placed at least one die. Once all dice have been placed (or no dice can be placed after a re-roll), your turn is over. … then replace the dice with tokens. Were you unable to place any dice after a roll or re-roll? Oh no! You’re not gathering any food this turn and you have to move the cat one step towards the pantry. 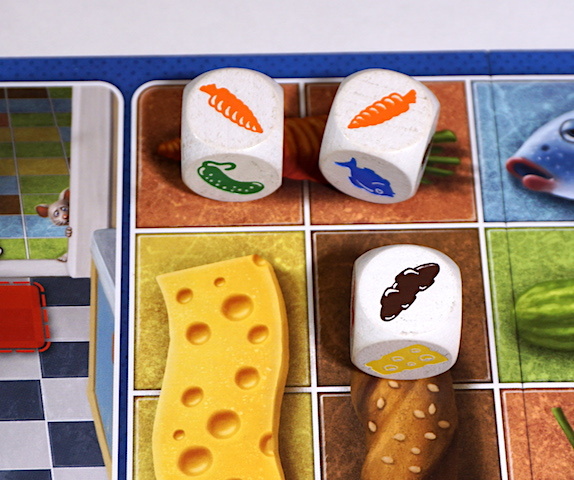 Alternately, did you place all the dice on food (or decide against pushing your luck to re-roll)? Hurray! Cover those spots with mouse tokens. The cat still moves one step towards the pantry – unless you managed to finish covering a food item. Pass the dice to the next player and continue. 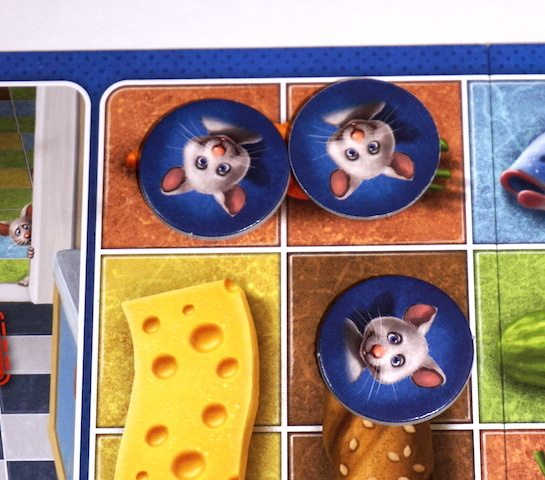 The game ends when either you cover all spaces on the board (the mice win!) or the cat reaches the pantry (the mice lose). Mmm! is one of our favorite games to play with children. Reiner Knizia has managed to create a press-your-luck puzzle that threads the needle between “too easy for adults” and “too hard for preschoolers”. Nominated for the 2016 Kinderspiel des Jahres (Children’s Game of the Year), Mmm! is fun for the whole family. The double-sided board scales the difficulty to make it appropriate for a wide age range. 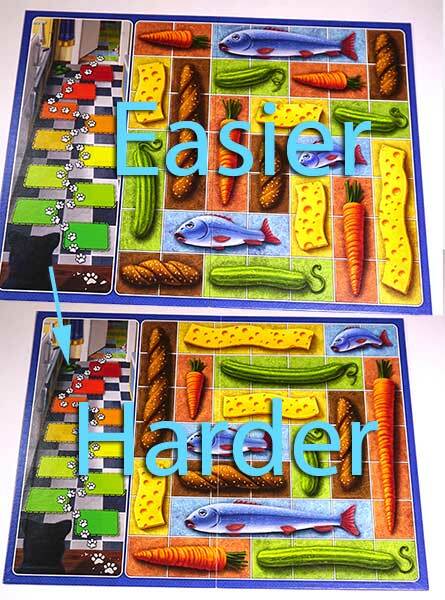 Adults should be able to beat the easy side (with shorter food items) every time, but the harder side offers some challenge. You can also play with a variant that restricts dice placement (all dice must be placed in a single row or column on your turn). Our youngest children enjoy matching the dice to food and moving the cat. Older children enjoy the puzzle aspect and pressing their luck, especially when using the more difficult side of the board. Our games often come down to the last one or two rolls of the dice. Use Mmm! to teach children about probability and how to calculate risk, while staying in a family-friendly theme that’s easy for them to understand. Even the “mean cat” looks pretty cute – probably why my toddlers have always enjoyed moving the token! Since Mmm! can be played either as a solo puzzle or a cooperative game, it mitigates a perennial struggle of playing games with preschoolers: attention span. Players can drop out or join at any time without changing the flow. Mmm! might not be worth buying if you don’t play games with young children. But it’s a great way to introduce board game concepts to preschoolers in a game that will grow with them. Find Mmm! on Amazon for around $30, or ask for it at your local game store. Then enjoy it with your family for years to come.